Usually, when I open a desktop icon, the image occupies the full screen, but lately I am only getting a small image (plse see attachment) about 4 ins x 6 ins in size (or postcard size), which means I have to click on VIEW in the said image and then choose FULL SCREEN in the dropdown menu. This is annoying. 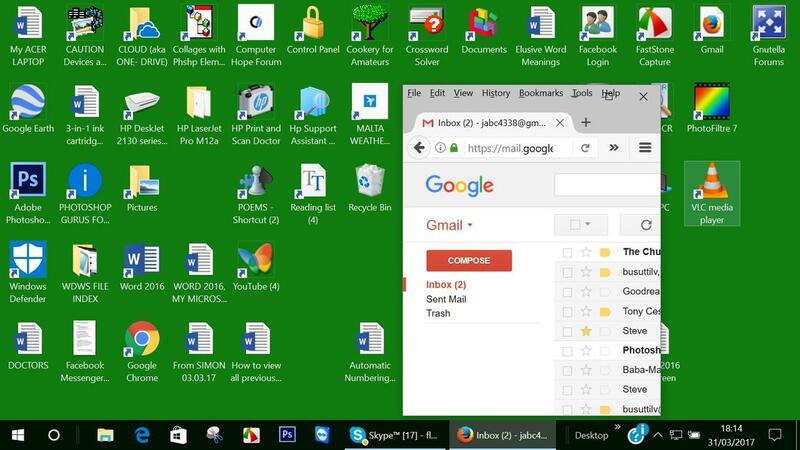 How to revert to my old practice without the bother of having to go to VIEW every time I open a desktop icon? I use Windows 10 and a laptop computer. My first thought was to simply stretch the browser window sideways to the right via the bottom right-corner until you can see the page options top-right of the browser window. This seemed too simple to suggest and might not be the problem. Many thanks for yr reply, which is greatly appreciated. Is there an easy way to restore the size of the default page? If I go to VIEW and hit on FULL SCREEN my problem is not solved because the FULL SCREEN view does not show the toolbar that pops up when I open Gmail. it does not show the rectangular box that I normally click on to enlarge the image. where there is the box for two rectangular images overlapping each other and that is used to minimize the page. Hope I am not confusing the issue. I would be able to show you exactly what my problem is. Hope I am not asking too much of you. Stretching the browser page to the size you would prefer should reset how the page will be opened from that point on or after you re-open the browser. If you are aware of any web-page URL's that shrink the web page, then right-click the link to open in new window (or open new browser window before opening the URL.) Close that page when finished with that page. If I am not understanding your problem properly, please give me more details. Next time I get a small window which I cannot enlarge without losing the toolbar, I will try and send it as an attachment to clarify my problem. Meanwhile, if in the small window I hit VIEW > FULL SCREEN the page occupying the whole space of the monitor will not show the toolbar, i.e. the bar which carries the words, FILE, EDIT, etc. You will be pleased to know that I have solved the problem of enlarging the 4 x 6 image. This happened quite by accident when I hit the HELP tab on the said image. Partly hidden and rather faint behind the HELP tab, I spotted that small square figure which is normally used for maximizing the picture and is sited on the very left of the cross that is used for closing the page. Ever thankful for your help, your kindness, promptness, and patience with me.